Report your observations of 8P/Tuttle to: pjenniskens [at] seti.org. Media inquiries should be directed at the NASA Ames Public Affairs Office: rachel.l.prucey [at] nasa.gov. Peak time: peak at about 20 - 22.2 h UT (= 12 h a.m. - 2.2 h p.m. Pacific Standard Time). Meteor brightness: mostly faint meteors? Hard to see meteor shower outburst that only occurs when the parent comet 8P/Tuttle returns (due January 2008). Old dust that holds clues to how cometary dust weathers the space environment. The Ursid shower is very hard to observe from the ground, but can be detected with intensified cameras and low-light-level cameras that adjust to the bright Moon background light. A more direct way to participate in the mission is by observing the parent comet 8P/Tuttle with your telescope and CCD camera when it makes its favorable return in December of 2007 and January of 2008. More information. General tips on observing meteor showers from the American Meteor Society and the International Meteor Organization. 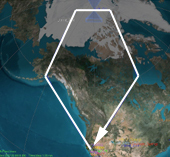 Banner photo shows Earth from the perspective of the approaching Ursid meteoroids, and the orbit of 8P/Tuttle as shown by the Orbit Viewer applet orignially written by Osama Ajiki (AstroArts) and modified by Ron Baalke (JPL). +2007 Dec 21 - Quadrantid MAC mission approved. Quadrantid MAC (Jan. 03-04) will for the first time map the flux profile of the annual Quadrantid shower under nearly unchanged observing conditions throughout the night. The data will be used to determine if the shower could have been created in 1490 AD. + 2007 Dec 20 - We learned this morning that our alternative to do a shorter flight from the East coast during this Saturday's Ursid shower is a no-go. Our request proved too short notice to make it work. 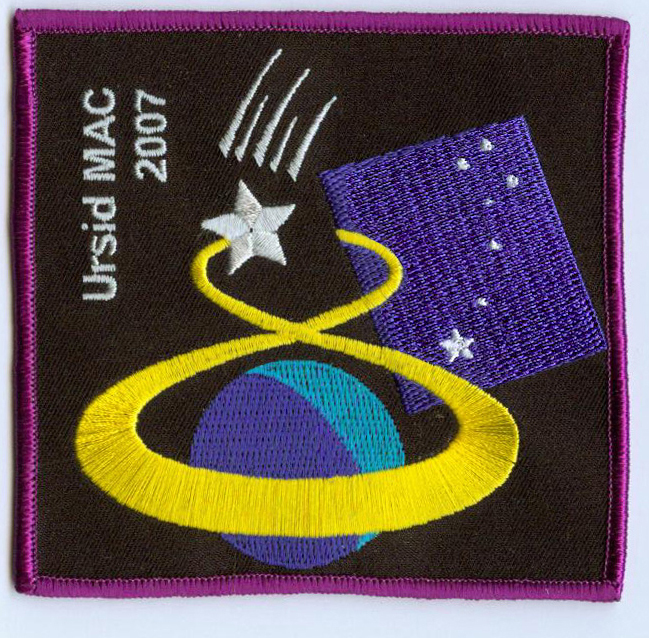 The good news is that the issue that doomed the Ursid MAC mission appears to have been solved and chances are increasing that the January 3 Quadrantid MAC mission will proceed as planned. We are waiting for a go/no-go decision. + 2007 Dec 18 - It is still uncertain whether the mission will proceed as planned. 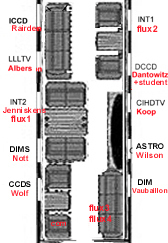 + 2007 Dec 16 - Participant Ron Dantowitz reports that spectrographs have been tested: Six fields of view, largest is 40 deg x 30 deg x 11 megapixels with 6 pixels between the sodium doublet. Other FOVs are wide and narrow, with low res for metals and higher resolution and f/0.8 fast lenses. Gratings have max exposure to the higher orders. Helium, neon, and sodium sources were tested. + 2007 Dec 14 - Mission patch arrived today. + 2007 Dec 13 - Scheduling issues prevent us from moving ahead as planned. + 2007 Dec 13 - DLR Cosmic ray exposure counter for Ursid MAC mission arrived today at SETI Institute. + 2007 Dec 12 - Ames visitor clearances approved. + 2007 Dec 10 - The mission follows conveniently one week after the AGU Fall Meeting in San Francisco (Dec. 10 - 14), where results from the Aurigid MAC mission will be presented. Follow the shaddow keeps the aircraft in 14 hours of darkness. The graph shows the Earth as seen from the perspective of the approaching Ursid meteoroids on December 22, 2007, at the peak of the anticipated Ursid outburst. 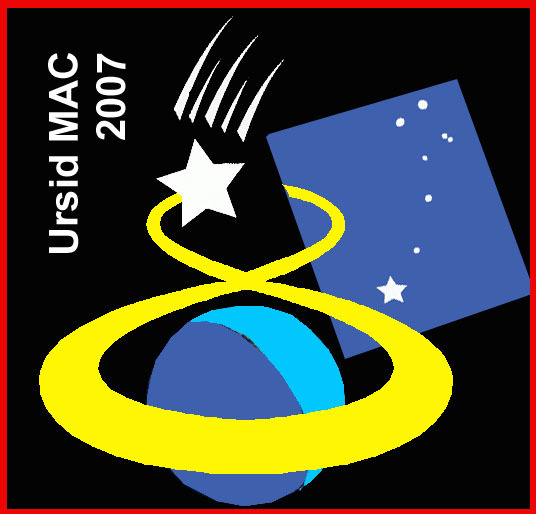 The Ursid MAC mission is dedicated to observing the December 22, 2007, Ursid shower outburst from altitude, where the Moon is mostly out of the picture, and where the low extinction near the horizon creates a large surface area for counting meteors and for measuring spectra for meteoroid composition. Nighttime areas on Earth on Dec 22. 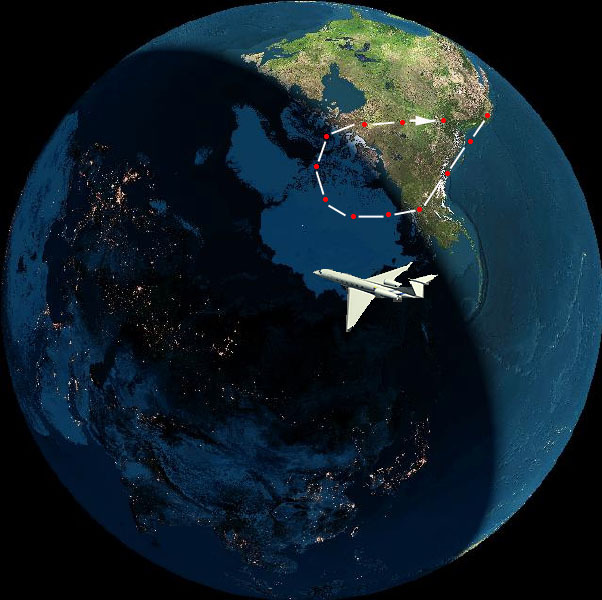 The proposed flight plan would take off from NASA Ames Research Center in California in the early morning hours of December 22, when it is still dark, then fly north-west to stay in darkness. 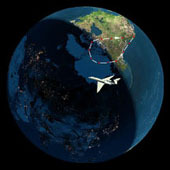 The plane would then fly north to Alaska, over the arctic and Canada, and back to NASA Ames, where we would land just after sunset. This provides for a 14 hour period of darkness. 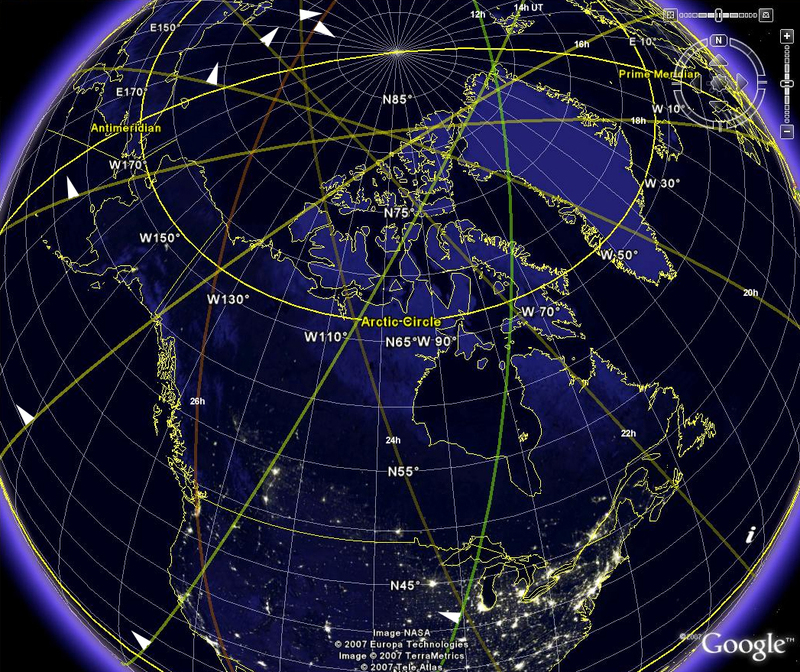 The direction to the Moon (azimuth and elevation) for the flight path shown above is depicted in the graph below. Click on picture for a larger version. Elevation and azimuth of the Moon for the flight path shown above. Data: Jim Albers, Lockheed Martin. 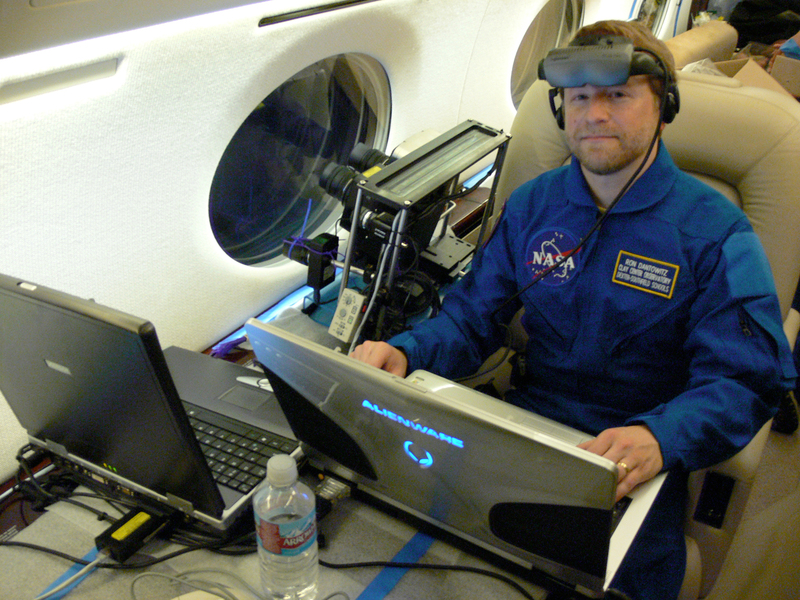 A privately owned Gulfstream GV aircraft has been made available for this mission, providing a total of 10 windows to the shower for 14 participating researchers and volunteers. 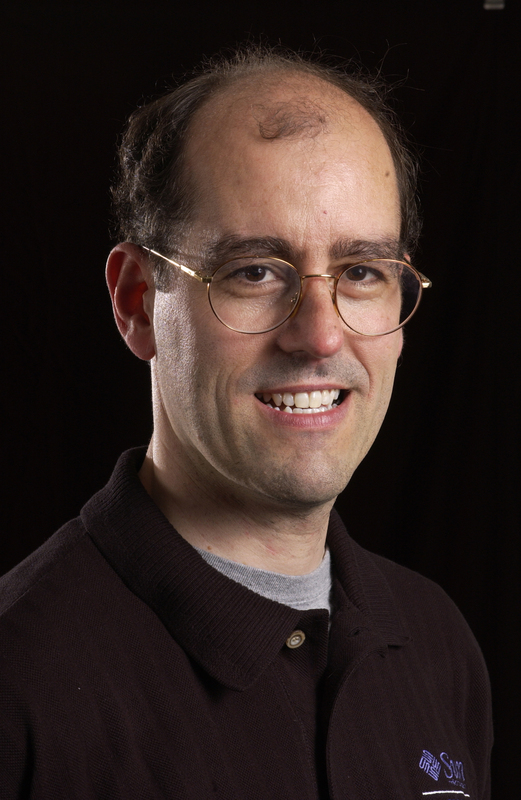 Principal Investigator Dr. Peter Jenniskens is a research scientist with the Carl Sagan Center of the SETI Institute. 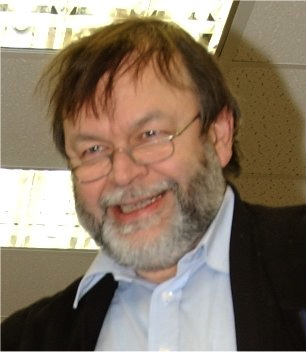 He is an expert on meteor showers and author of the 790-page book " Meteor Showers and their Parent Comets". He has earlier led an observing campaign to explore the Aurigid shower. He will participate in near-real time flux-measurement team. 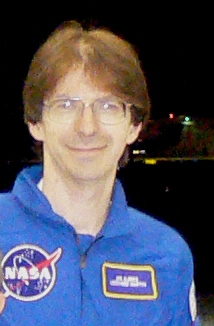 Other participants will include experienced meteor observer Robin Gray of Nevada. 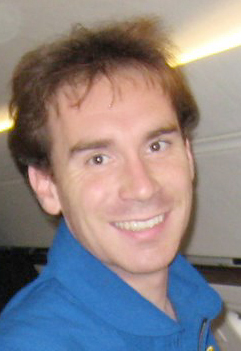 Meteor astronomer Jeremie Vaubaillon of Caltech, an expert in meteoroid stream modeling, will operate a digital camera to capture Ursid meteors. His Aurigid MAC result was selected as Astronomy Picture of the Day. Juergen Wolf, SOFIA scenior scientist from DLR, at NASA Ames will field test in meteor shower observations a prototype camera for the SOFIA Airborne Observatory. Ron Dantowitz, director of Clay Center Observatory at the Dexter and Southfield Schools, and a student from Dexter School (Ari Atinizian) will deploy CCD cameras for meteor spectroscopy of relatively bright Ursids to study how the meteoroids break and release their volatile minerals. 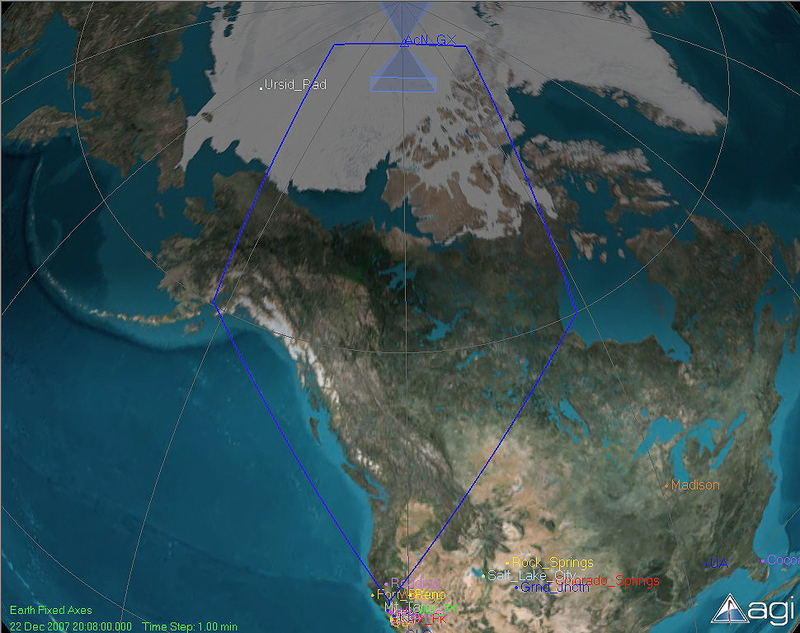 Jim Albers and Michael Koop of Lockheed Martin will operate a set of low-light-cameras to measure the magnitude distribution of Ursid meteors. Rick Rairden of Lockheed Martin will focus on the near-UV part of meteor spectra, which are difficult to detect due to the properties of the aircraft windows. Ed Schilling, branch chief of the NASA Ames video and graphics branch will lead an effort to image the meteor shower using state of the art HDTV cameras. 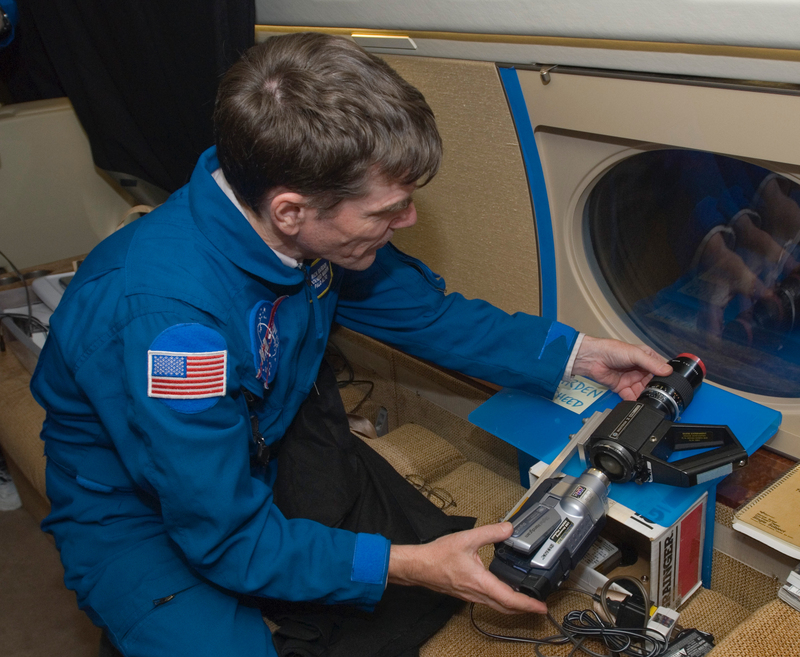 Dr. Guenther Reitz head of the Radiation Biology Department of the Institute of Aerospace Medicine of the German Aerospace Center (DLR) in Cologne, Germany will focus on measurements of the radiation exposure by cosmic rays in high aircraft flight altitudes.